It's already over 5 years since Singapore Airlines introduced the Airbus A380 back in 2007, but its taken this long for me to finally sample the premium cabins and write about it. Previously I've flown only in economy on the Singapore whalejet so I was very excited when the time finally came to try the suites. My journey had started in Myanmar and I'd flown in to Changi airport with about 7 hours to spare before the 1am departure to Zurich. I decided to hit The Private Room, Singapore Airlines exclusive lounge for first class passengers. As you enter the Silverkris lounge area in terminal 3 and present your Suites boarding pass you will be personally escorted past the business class and first class lounges and into the Private Room. I was warmly welcomed and shown to the shower facilities after I requested directions. After a refreshing shower it was time for a meal and The Private Room (TPR) features a restaurant with cooked to order meals. I arrived and found only two other diners present so after taking my seat in a booth I was immediately offered a menu and asked if I'd like a drink. I ordered a champagne which at the times was a Charles Heidsieck. I perused the basic but ample menu whilst I waited for my drink. In addition to the menu there is a self serve buffet offering various appetisers, hot foods, salads and desserts. I ordered the satay to start with and the wagyu beef burger with quail egg to follow. Both the satay and the beef burger were absolutely delicious. At all times my champagne glass was replenished by the attentive but not intrusive waiter. I had a bottle of Perrier to go along with the meal. Once I was finished I was asked if I wanted to order some more food, the staff had very little to do and seemed very keen for me to try more of the menu items but I decided to just grab a few sweets from the buffet to finish up with. I exited the dining area and went out into the terminal to meet up with a friend who was also in transit on Emirates and we went shopping for a while before we parted ways and I headed back to TPR. Upon my return the staff recognised me immediately and again tried to get me to dine in the restaurant but I knew I had a substantial meal ahead of me onboard so once again I declined and headed to the lounge area which has a very 'first class' feel with lovely decor and nice big armchairs. Eventually it was time to head to gate B5 which was quite a trek from the lounge and it was at this point I missed the convenience of the Thai Airways buggys at the equivalent lounge in Bangkok. I think Singapore should offer this service to its first class passsengers too. Anyway they don't so it was a 10 minute stroll through to the gate. Boarding had commenced and there was the usual hoard of people crowding the jetway. I managed to get around many of them with constant "excuse me's" and eventually I got to the dedicated jetway for Suites passengers. It's a pity it is not easier to access but I guess I was a bit late and missed the early boarding call. Once on board I was warmly welcomed and personally escorted to suite 3A. Confirmation my Suite is CLEAN! The crew were lovely and showed me where I could store my jacket in my own personal wardrobe which is a part of the suite, I was also asked whether I was familiar with the suite features. I told the flight attendant I unfortunately was not, so she went about explaining all of it including the fact that the seat was upholstered in hand stitched Italian leather! I noticed a personally signed note had been left by the ground crew informing me that my suite had been cleaned and dressed just beforehand... a nice touch. The next big decision I was presented with was would I prefer a glass of Krug or Dom Perignon before departure ? How good is this? I opted for the Krug as its a drop I've not experienced before on an aircraft. Moments later the crew member returned with a Champagne flute on a tray and a freshly popped bottle of Krug which was poured at my seat. Glass in hand I familiarised myself with the suite and the cabin in general. Around this time the senior crew member approached and introduced herself and thanked me for flying with them. I was told if there was anything I needed I should just ask. I was already feeling incredibly looked after and with only 3 other passengers in suites the service remained brilliant throughout the flight. A menu and drinks list came and I flicked through to see what was on offer. I had pre ordered a steak from the book the cook menu in advance and decided to stick with that for my main course. The meal service on SQ346 being a very late night departure was a supper service with breakfast in the morning, and if you were hungry there was several snacks available on demand in between. Also at the seat were a pair of Bose noise cancelling headsets, a pair of Givenchy pyjamas and a Kiehl's amenity kit. I am fairly safety conscious so I never get changed into pyjamas or remove my shoes until after takeoff and the seatbelt sign is turned off. I'd hate to have to evacuate an aircraft in an emergency in pyjamas with no shoes on. Some of the other passengers though were already changed by the time we left the gate. The captain made a PA and announced the flying time to be around 12.5 hours which was more than enough time to have a couple of good meals, watch a movie and get a decent sleep. My champagne had been refilled and I was feeling completely relaxed. I just wished I could fly like this more often. Eventually we pushed back and the A380 gracefully climbed into the night sky and set course for Zurich. It wasn't long before the crew were up and about and had delivered me a cocktail with some warmed nuts. One of my fellow passengers immediately converted his seat to a bed, closed his door and went to sleep. I guess for some people who travel like this on a regular basis then the meal service isn't exciting or as important to them as a good rest. To be honest I wasn't even that hungry but I had every intention of experiencing the entire suites product. It's worth mentioning at this point that in this suite the seat and the bed are two completely separate parts. The seat itself reclines and slides forward but it doesn't go flat. When you want to sleep the bed folds down from the wall and the seat and side table tuck underneath the bed. So in seat mode you can lounge, eat and watch TV and the basic seat controls are pictured above. The huge table is only available in seat mode and a flight attendant came around to set mine up. A table cloth was placed on the table and cutlery and plates set up. The lighting in the cabin had been adjusted to a dull orange glow to allow for those who wanted to rest immediately. The suite had turned into my own personal bedroom with Givenchy sheets, blankets and pillows. A basket containing snacks, writing materials and a deck of Singapore Airlines playing cards had been left for me just in case I might like them during the night. It was just incredible and after the crew wished me good night I closed the doors to the suite and I felt like I was on my own private jet. It was worlds away from what the economy class passengers must have been experiencing just metres away. I got into bed which is almost as comfortable as being at home and the comfort combined with the very quiet A380 cabin soon saw me fast asleep, I hope i wasn't snoring! At some point I woke up needing the toilet (which by the way is cleaned by the crew after every visit!). By the time I got back to my suite a crew member had been around to make my bed and freshen up the suite. Simply amazing! I went back to sleep and woke up again with about 3 hours to landing. I lay in bed for a while watching tv shows on the huge screen and just relaxing. I was wishing the flight could be longer ! Eventually though it was time to convert the suite back into seat mode and have breakfast. The lights stayed dimmed during breakfast as some passengers continued to sleep. The crew member responsible for cooking my eggs stopped by after I ate and enquired as to whether I was happy with them. I told him they were perfect and he seemed rather pleased ! The entire experience up to this point had been just incredible. I can't fault a single thing... so when I felt the aircraft commence it's descent into Zurich I felt bitterly disappointed that it would soon be over. It was time to pack up and change back into my clothes for landing. The captain had mentioned fog for our arrival in Zurich and he wasn't wrong! We landed in what was essentially zero visibility in darkness and fog. I did not see the runway at all until we had touched down and then it was only the glare of the lights as we went by. Check out my YouTube video of this flight and you will see what I mean. The flight was over and it was time to disembark and bid farewell to the amazing crew who had served me during the flight. 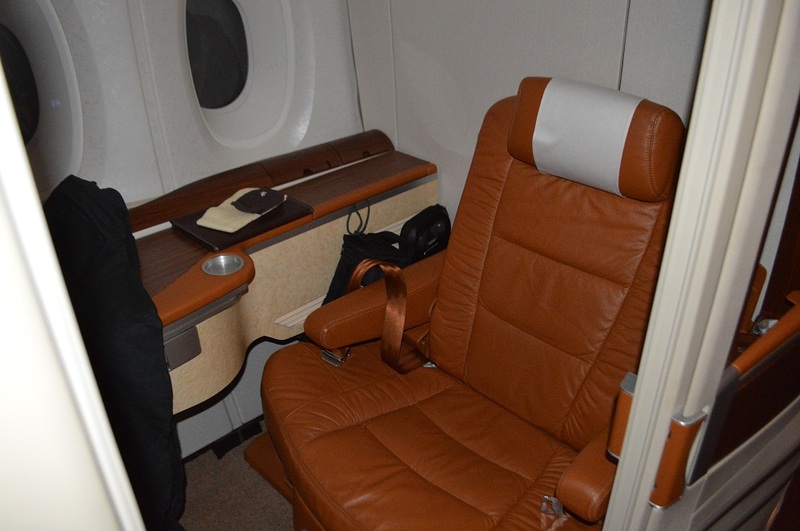 They are a credit to Singapore Airlines and I definitely felt that the slogan Singapore uses for its suites 'A Class Above First' was well deserved. I can't wait to get another chance to fly on longhaul suites again in the future. I love the a380 I have flown on QF a380 about 10 times and SQ 1 time? I love reading the reviews from your perspective. I prefer the qF a380 but the SQ is great too! I've only flown the Qantas A380 in economy and premium economy. I hope that in the next few months I might try the First Class product and you can definitely expect a review of it here. What did you think of the QF a380? an awesome read, best review to date. you sir, are the defination of a boss. Thanks for the review! Ticket must have cost a bomb? Mate, Suites are the best aren't they? I'm going to ZRH in May in J Class. Thinking of ways to upgrade LOL. 12 hour flight should allow time for a decent sleep I hope? Coz SYD-SIN on Suites is just way too short! plenty of time for sleeping on that flight! How would you compare these suites to the EK F product? I haven't tried them yet, I hope I can soon! Awesome review mate! Looks like you had a great trip. Would be taking suites myself soon. Were all the food in the private room restaurant as well as the book the chef option complementary?